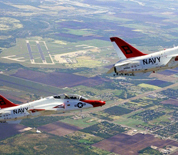 Naval Air Station (NAS) Kingsville is located in Kingsville, Texas. The base serves as a key location for Navy tactical jet pilot training and produces fifty percent of the Navy's jet pilots via Training Air Wing Two. The Wing conducts training operations flying the T-45 Goshawk. The base is home to two US Army Reserve units - F Company, 7-15th Aviation Regiment and the 370th Transportation Company Detachment 1. The Aviation Regiment provides MEDEVAC support in the area, while the Transportation Company participates in missions using Palletized Load System vehicles. NAS Kingsville is also host for the annual Wings Over South Texas Air Show. The city of Kingsville is home to one of the largest ranches in the world, Kings Ranch. The property is a designated National Historic Landmark, along with five other locations in the city. This NAS Kingsville directory features the critical info you’ll need to navigate through the many facilities and recreational opportunities available on base.